After an overnight stop at my cousin’s place in the port town of Newport News, Virginia, I was on my way to the northeast. It has been a week already since I have been on the road and boy, it has been quite an eventful week. I took some travel tips from my brother-in-law (who has been in Virginia for the last 10 years) and decided to take the route through the Chesapeake tunnel, instead of taking the I-95 freeway. This route is aptly called an engineering wonder of the world. This 20 mile long road consists of tunnels and bridges connecting various man-made and “real” islands over the Chesapeake Bay, thus making it faster and easier to reach New York. Once I crossed the Chesapeake tunnel, I hit the roads in rural Delaware. A lot changed over this route. There were no Chick-fil-A’s, no Bojangles. I saw only one Waffle House. I guess I had left the South by now. The couple of hours drive through Delaware was not much fun. It’s a slow route, with signals at short 2 mile long stretches. Not many cars on the road though. Mostly old pickup trucks carrying farm equipment and related stuff. The landscape is also dry with little greenery. I was glad when I left Delaware and hit the New Jersey Turnpike. There were definitely more cars. Reminded me of those lines from the Simon & Garfunkel’s song “America” — Counting the cars on the New Jersey Turnpike.. They’ve all gone to look for America. I guess there were a few others on this turnpike with me, who were roadtripping across the country. The drive through the turnpike picked me from the slow Delaware countryside and dropped me amidst the faster, aggressive drivers in Manhattan, New York. 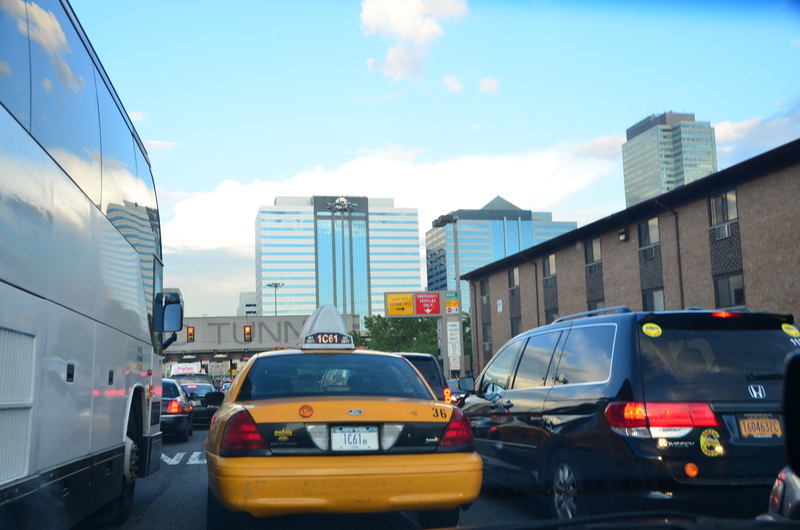 As I approached the Big Apple through the Holland Tunnel, I was torn and ravaged by the ruthless New York cars like a rookie in his first game. I tried to hide myself behind this big white bus in the picture below and maintain some gap between the bus and my car. In no time, a yellow cab driver noticed this gap, (he probably salivated too at the sight of this opportunity) and rammed his car between me and the bus. I was still recovering from the scars of this mini-battle, when I decided to unleash my hidden, rude Delhi driver beastiality. And that’s it I had enough. I drove bumper to bumper. Turned without giving indicators. And jumped at the slightest chance I got to edge past the nearby car. Within a few minutes, I was one of them too. A beast among the beasts. Driving through Manhattan was quite an experience. I’m glad my training on the roads of Delhi and Bangalore helped me fight through this madness. The next couple of days in New York and New Jersey were quite relaxing. I met a couple of former coworkers, Ravi and Priya in East Village. We bitched about our old jobs over some pho and spring rolls at a Vietnamese restaurant. The next day, I crashed at my Fuqua buddy Jonathan’s place in New Jersey. We met another friend of ours, Dean in Koreatown. The food was great and so was the eye candy (it always amazes me how well dressed is the average New Yorker usually). We ordered some seafood pancakes amongst various other dishes. We figured that the pancakes were really good and compared them with the pancakes one of our Korean friends brought to the Sunday potluck dinner when we were at school. We concluded that our Korean friend has made decent progress in her cooking skills over the last year or so (haha!). Jonathan’s lives in a quiet, lush green neighborhood in New Jersey. We spent a lot of time in his backyard talking about the future etc. I guess, this was a great place to take a relaxing break after a week on the road. Next stop is Boston – a city I wanted to visit for quite some time. you should have told me. 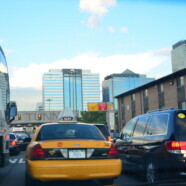 i am in NY now. I had no clue you were in NY.. I assumed you had left for Thailand.. I met JC and Dean in Koreatown.. Nancy was busy.. Anyway, come visit me in Cali with Shum..
Hey Ankur! I’m going to be around Niagara Falls, NY on Tuesday at around 6pm-8pm. By chance will you be there? I’m guessing that you’ll most likely still be in NYC at that time – or you’ll already be near Chicago. I am glad that you guys recognize the progress I’ve made in my cooking- so which was better, mine or the one you guys ate at the Korean restaurant? Driving in New York is indeed an experience! Watch me go with a U-haul there!